This is an on-going series of work produced from long-distance transportation taken in various countries. Using an iPhone camera, I capture the moving landscape once every 10 seconds on buses, trains, planes. Each of these frames is printed onto translucent paper and acts as a physical pixel on the canvas. 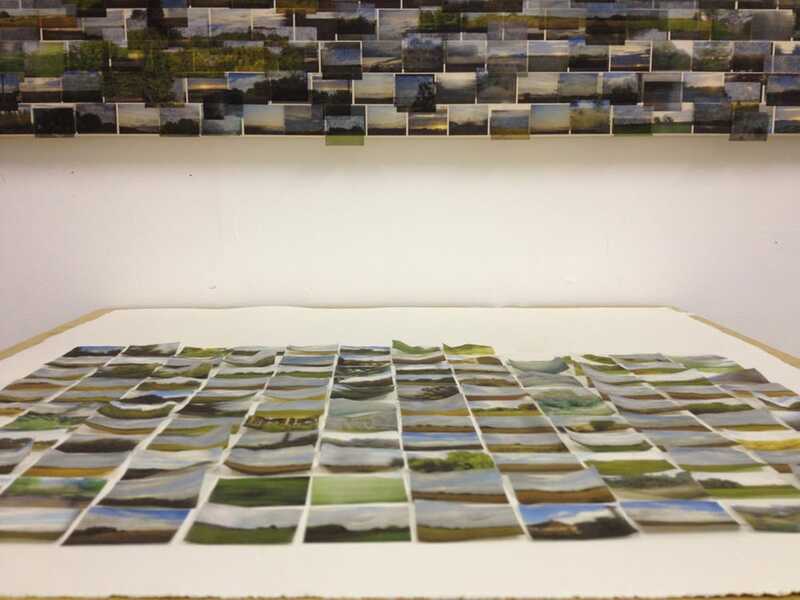 Arranged in rows and clouds, these pixels create a collage of landscapes that escapes temporality while implying motion. They give the impression of the recollection of a voyage in abstract vision, drawing inspiration from the impressionist painters while using a tool (phone camera) that was meant to offer us instant realism. These "surface installations" engage the viewers with an alternative way of reading landscape, and question the role of traditional landscape painting within the context of contemporary lifestyle and technological conditions. In addition, they comment on how memory works - like clouds - overlaps, eludes, hides, fades, evolves, yet permanently exists.